Vanderbilt University Medical Center is encouraging its medical providers to stop using saline as intravenous fluid therapy for most patients, a change provoked by two companion landmark studies released Feb. 27 that are anticipated to improve survival and decrease kidney complications. Saline, used in medicine for more than a century, contains high concentrations of sodium chloride, which is similar to table salt. Vanderbilt researchers found that patients do better if, instead, they are given balanced fluids that closely resemble the liquid part of blood. “Our results suggest that using primarily balanced fluids should prevent death or severe kidney dysfunction for hundreds of Vanderbilt patients and tens of thousands of patients across the country each year,” said study author Matthew Semler, MD, MSc, assistant professor of Medicine at Vanderbilt University School of Medicine. The Vanderbilt research, published Feb. 27 in the New England Journal of Medicine, examined more than 15,000 intensive care patients and more than 13,000 emergency department patients who were assigned to receive saline or balanced fluids if they required intravenous fluid. “The difference, while small for individual patients, is significant on a population level. Each year in the United States, millions of patients receive intravenous fluids,” said study author Wesley Self, MD, MPH, associate professor of Emergency Medicine. “When we say a 1 percent reduction, that means thousands and thousands of patients would be better off,” he said. The authors estimate this change may lead to at least 100,000 fewer patients suffering death or kidney damage each year in the United States. “Doctors have been giving patients IV fluids for more than 100 years and saline has been the most common fluid patients have been getting,” said study author Todd Rice, MD, MSc, associate professor of Medicine. 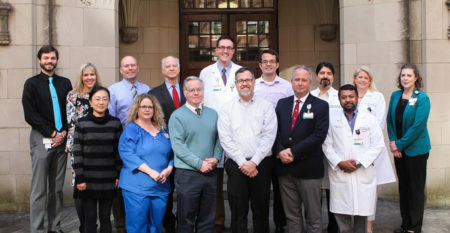 “With the number of patients treated at Vanderbilt every year, the use of balanced fluids in patients could result in hundreds or even thousands of fewer patients in our community dying or developing kidney failure. After these results became available, medical care at Vanderbilt changed so that doctors now preferentially use balanced fluids,” he said. Conducted between June 2015 and April 2017, the studies involved collaboration between several departments including Medicine and Emergency Medicine, Anesthesiology, Surgery, Trauma, Pharmacy, Nursing, Biostatistics and Biomedical Informatics. The novel design of the studies, in which the electronic health record (EHR) was used to direct patient care, monitor outcomes and compile the findings, demonstrates the potential of VUMC’s Learning Healthcare System to integrate clinical research and clinical practice, speeding the application of scientific discoveries to patient care. Other contributors to the studies included: Gordon Bernard, MD, VUMC’s Executive Vice President for Research and director of the Vanderbilt Institute for Clinical and Translational Research; Daniel Byrne, MS, senior associate in Biostatistics and director of Quality Improvement and Program Evaluation; Christopher Lindsell, PhD, associate director of the Center for Clinical Quality and Implementation Research; Jonathan Wanderer, MD, assistant professor of Anesthesiology; and Li Wang, MS, Biostatistician III.